Mulayam is that one leader who never fails to betray anyone who was foolish enough to trust him. As they say, there is no honor amongst thieves. How far Nitish has fallen by associating himself with the chaura chor Lalu and the Congis! The seculars deluded Nitish into believing he was Modi-slayer, the hero who will confine Modi to the state of Gujarat. Little did Nitish suspect that both him and the people who deluded him will be washed away by the tides of recent history. Nitish Kumar deserves this fate fully. If Nitish loses the upcoming elections, his political obituary will become complete. Nice to be back bro. Who is BJP's candidate for CM post? Or BJP is still selling Modi? 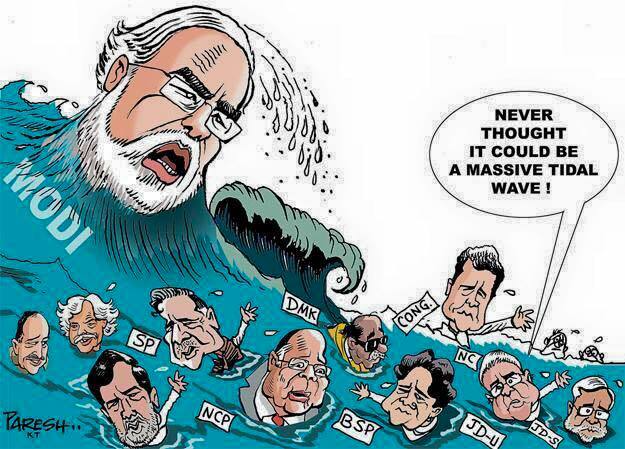 Many opponents of Modi misunderstand his appeal and this is where all their troubles begin. So I repeat, there exists two things when it comes to Modi. The physical man of flesh and blood and the symbolic ideal of a politician with the best interests of the nation at heart coupled with the capability to deliver on that promise. More than the man, it is the symbol which is important for people who love him and vote for him. It is this symbol that shall flower the next generation of leaders who will be capable of steering India through the dangerous times ahead. Compared to this image of Modi, the other politicians of our times aka Rahul Gandhi, Kejriwal, Mulayam Singh, Nitish Kumar etc. are flawed defective hasbeens. Well Indian psyche has always been moving from one symbol to another and one ritual to another. the next line of BJP leadership is not coming, it is either Modi or it is Modi. And if you are fighting against something as credible as Nitish is in Bihar, you must have something elemental rather than symbolic. Nitish as an elemental? Sorry, bro but that Nitish has been long gone and buried. At this point of time, Nitish Kumar is just a punctured balloon out of gas ever since he parted ways with the NDA to join hands with Laloo and the Congress. Time to merge this Thread with "Dilli ka Thug"
first sentence there - which party has next line of leadership? Congress isn't even prepared for who after Rahul Gandhi 2.0, 3.0, ... Many generations like self acclaimed Pilot family still subservient, Scindia the royals licking real royal family of Gandhis for generations. Ramu kaka ka beta Shaamu ka beta Gopu, list goes on. many oxymorons in the second sentence - credible and Nitish You are as sickular as they come. Lalu & Nitish would give anything to finish off the other politically. As long as he was in NDA, he was shining star at the end of the path. For your first sentence, does this make BJP as just like other parties, for I though this is the party without dynasty and should have powerful second line. Pre-independent congress had three line of leadership. Gandhi's people like Gokhle and then Nehru and his team and then Shahstri ji and his team. Secondly, If Lalu and Nitish would give anything to finish off the other politically, won't BJP try to do this if push comes to the shove? I know right-winger like you are generally devoid of reasons.